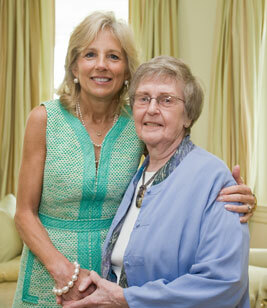 Dr. Jill Biden, wife of Vice President Joe Biden, with Phyllis Connelly. On May 5th 2012, Advocacy Committee members traveled to Washington, DC to participate in the National Breast Cancer Coalition’s (NBCC) Annual Advocacy Training Conference and Lobby Day. There, they met with Senators and Representatives of local congressional districts. These meetings give Advocacy Committee members the opportunity to educate lawmakers about breast cancer issues and advocate for identified legislation, as well as to hear their questions and feedback on how the legislative climate is addressing, or not addressing, breast cancer issues. To learn how you can participate in the next planned trip to The NBCC National Conference and Lobby Day, please contact the Coalition. Photos from past Washington Trips can be found here. Accelerating the End of Breast Cancer Act. In 2010, the National Breast Cancer Coalition (NBCC) set a deadline to know how to end breast cancer and launched a plan to achieve it. Breast Cancer Deadline 2020® is a call to action for all stakeholders to focus efforts on knowing how to end the disease by the end of the decade. The “Accelerating the End of Breast Cancer Act,” defines an important role the federal government must play in this effort. The legislation complements and enhances the strategic work being done by NBCC to end breast cancer once and for all. $150 Million for the Department of Defense (DOD) Breast Cancer Research Program (BCRP) for FY2016. As a result of NBCC’s grassroots advocacy, the DOD BCRP was created in 1992 to “eradicate breast cancer by funding innovative, high-impact research through a partnership of scientists and consumers.” The DOD BCRP is widely viewed as an innovative, unique, and efficient medical research model which has proven to be accountable to the public and has produced extraordinary results. NBCC seeks continued funding for this successful program. Guaranteed Access to Quality Care for All. Ensuring access to quality, evidence-based health care has been a top priority of NBCC for many years and is an essential component of Breast Cancer Deadline 2020®. NBCC works to identify, advocate for, and support the implementation of laws such as the “Patient Protection and Affordable Care Act” which mark important steps forward in access to quality health care for individuals with, and at risk of, breast cancer. In addition, NBCC remains committed to protecting vital existing programs, such as the Medicaid Breast and Cervical Cancer Treatment Program (Medicaid BCCTP). Ensuring the Participation of Educated Patient Advocates in All Levels of Health Care Decision Making. NBCC continues to work to ensure that educated patient advocates have a “seat at the table” in all levels of health care decision making which affects their lives. For more information please visit www.stopbreastcancer.org. Learn about the Advocacy Committee’s work on the Local and State levels.